I wanted to write this entry a few weeks ago but I decided to wait a few weeks to see if it was worth the time, it definitely is. Every Saturday morning, my roommate and I drag ourselves out of bed at 11:45 a.m. for one reason and one reason only. Not work, not because we want to do something with our day, but to see Lee Corso's animated college football predictions on ESPN's College Gameday. 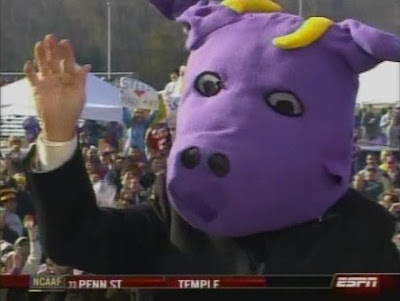 For anyone who hasn't seen it Lee Corso's infamous mascot impersonations you are really missing out. The crazy old man (who's sobriety is very questionable) makes his prediction on one of the major college football games of the day and then dresses himself as the mascot of the team he supports. I know what your saying, "sounds kind of corny to me." But you really have no idea, watch this. Trust me its worth the click. After that, can anyone seriously tell me that Lee Corso doesn't have one of the best 2 minutes on television? He has to be the coolest 73-year old man on the planet. Let's be serious, what other 70-year old man has a myspace besides John McCain? Imagine that, John McCain in a Trojan costume, now that would be a site to see. Anyways I'd like to send out a personal thank you to you, Lee Corso, for entertaining us all, giving me a reason to get out of bed on Saturday's and most of all being a TV celebrity who can put his ego aside and let the joke be on him every now and then. If you find this as funny as I do, ESPN College Gameday airs every Saturday from 10:00 a.m. ET to 12:00 p.m. ET so tune in. 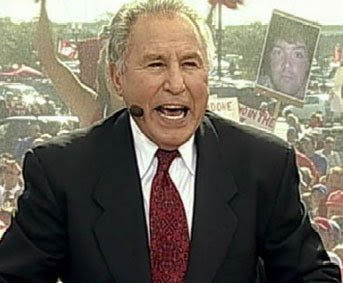 Or you can go here, and see a number of Lee Corso's hilarious antics from the past.